Toxic implications of Diamond nanoparticles: influence upon freshwater Asian clam. The scientific community has become aware of the potential risk that nanomaterials have from the toxicological point of view. Many implications for aquatic ecosystems and their effects on living organisms must still be evaluated to have a full understanding of their implications for health and the environment. Therefore, the study of the toxicity of nanodiamonds (NDs) on bivalves, and in particular on freshwater clam (Corbicula fluminea), is of great interest. Thus, the effect of exposure to different nominal concentrations (0.01, 0.1, 1, and 10mg.l−1) of ND during different periods of time was analyzed. 1UCIBIO, REQUIMTE, Departamento de Química, Faculdade de Ciências e Tecnología, Universidade NOVA de Lisboa, 2829-516 Caparica, Portugal. 2Departamento de Química-Física, Facultade de Ciencias de Ourense, Universidade de Vigo, Campus de As Lagoas S/N, 32004 Ourense, Spain. The use of different nanomaterials in different areas of technology such as the case of various nanoparticles (NPs) offers interesting opportunities in different production processes of the industry, in daily consumables in different fields such as medicine, biotechnology or electronica, among others. That is why in recent years the applications of these materials have experienced an important boom. Therefore, applications of nanomaterials have experienced a large increase in recent years. In spite of all this, the current legislation and the different regulations regarding the applications of these materials in the European Union do not allow for a development as rapid as would be desirable, given its possible impact on health and the environment. The most widespread definition of NPs considers them as particles that have a diameter less than 100 nm . Given their colloidal nature, they present physicochemical properties responsible precisely for their applicability ,. But we must underline that it is these characteristics, too, that make these nanomaterials potentially toxic due to the increase in chemical reactivity and biological wetness. In particular, these NPs have a high capacity to generate free radicals,,. Another aspect that we have to take into account in terms of the possible toxicity of NPs is their ability to cross biological barriers such as cell membranes,. One of those NPs are nanodiamonds (ND). These nanomaterials have been the object of a deep study given their use in the separation by adsorption, purification and characterization of different molecules of biological interest, such as proteins, the active ingredients of various drugs, genes or different antibody carriers. Likewise, luminescent diamond nanocrystals are applied to fluorescent labeling, to the design of biosensors or to image probes . It is for all this that the determination of the bioaccumulation of these materials using in vivo tests, to determine the fate in the metabolic chains of different living organisms. Thus, Yuan et al. reported that ND injected intravenously (in an experiment that lasted for 28 days) accumulated in the liver, lungs and spleen of mice. There is ample evidence in the literature that carbon-based nanomaterials, such as multiwall carbon nanotubes, single-walled carbon nanotubes and fullerenes, showed that they bioaccumulate in Daphnia magna ,,,,,. This bioaccumulation causes oxidative stress responses. Oxidative enzymes play a key role in the defense response against the effects of ROS (reactive oxygen species) that damage lipids, proteins and nucleic acids. Thus, these enzymes form an important component in the antioxidant response of organisms, and their study will provide valuable information on the effects of NPs on living organisms. For all this, the scientific community has become aware of the potential risk that these materials have from the toxicological point of view. Many implications for aquatic ecosystems and their effects on living organisms must still be evaluated to have a full understanding of their implications for health and the environment. Therefore, the study of the toxicity of nanodiamonds (NDs) on bivalves, and in particular on freshwater clam (Corbicula fluminea), is of great interest. Thus, the effect of exposure to different nominal concentrations of ND during different periods of time was analyzed. The NDs used were between 4 and 6 nm in size, and after the bivalves were exposed to them, the enzymatic activities of oxidative stress (glutathione-S-transferase, catalase) and lipid peroxidation were determined. An increase in GST activities was observed after 7 days in bivalves subjected to concentrations of NDs greater than 0.1 mg.l-1. In the case of catalase these significant increases were found bivalves exposed to concentrations ranging from 0.01 to 1.0 mg.l-1, after 14 days of exposure. The histological analysis showed vacuolization and thickening in the cells of the digestive glands. Regarding lipid peroxidation, it exhibits a clear upward trend when ND concentrations are increased. This result is compatible with the cellular damage observed in the histology. Fig. 1: Nanodiamonds by AFM (a), TEM (b) and size distribution (c) in aqueous suspensions. From Cid et al. In this way, the studies carried out on C. fluminea show a correlation between the concentration of NDs and the induction of GST and CAT. 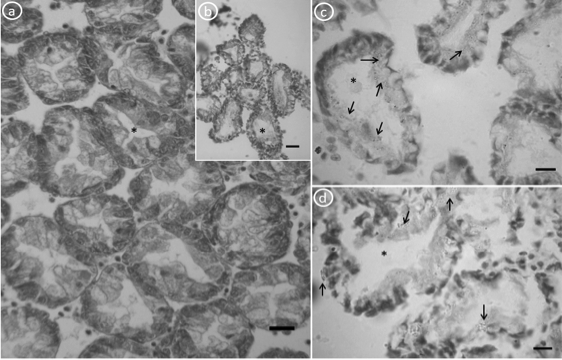 The exposition shows an oxidative response to stress and an increase in lipid peroxidation (MDA content) associated with damage to cell membranes that result in histological alterations in epithelial cells of the digestive glands as shown in figure 2. DG lumen (*). Scale bar: 20 µm (a, b); 10 µm (c, d). From Cid et al. A. Kahru, H.-C. Dubourguier, From ecotoxicology to nanoecotoxicology, Toxicology 269 (2010) 105–119. M. Tyshenko, D. Krewski, A risk management framework for the regulation of nanomaterials, Int. J. Nanotechnol. 5 (2008) 143–160. G. Oberdorster, E. Oberdorster, J. Oberdorster, Nanotoxicology: an emerging discipline evolving from studies of ultrafine particles, Environ. Health Perspect. 113 (2005) 823–839. B. Nowack, T.D. Bucheli, Occurence, behavior, and effects of nanoparticles in the environment, Environ. Pollut. 150 (2007) 5–22. A. Nel, T. Xia, L. Madler, N. Li, Toxic potential of materials at the nanolevel, Science 311 (2006) 622–627. T. Xia, M. Kovochich, A. Nel, The role of reactive oxygen species and oxidative stress in mediating particulate matter injury, Clin. Occup. Environ. Med. 5 (2006) 817–836. G. Oberdorster, V. Stone, K. Donaldson, Toxicology of nanoparticles: a historical perspective, Nanotoxicology 1 (2007) 2–25. M. Heinlaan, A. Kahru, K. Kasemets, B. Arbeille, G. Prensier, H.-C. Dubourguier, Changes in the Daphnia magna midgut upon ingestion of copper oxide nanoparticles: a transmission electron microscopy study, Water Res. 45 (2011) 179–190. A. Krueger, J. Stegk, Y. Liang, L. Lu, G. Jarre, Functionalised nanodiamond: biotinylation of detonation diamond, Langmuir 24 (2008) 4200–4204. Y. Yuan, X. Wang, G. Ji, J.-H. Liu, T. Wang, Y. Gud, S.-T. Yanga, S. Zhen, H. Wang, Pulmonary toxicity and translocation of nanodiamond in mice, Diamond Relat. Mater. 19 (2010) 291–299. S. Zhu, E. Oberdörster, M.L. Haasch, Toxicity of an engineered nanoparticle (fullerene, C60) in two aquatic species: Daphnia and Fathead minnow, Mar. Environ. Res. 6 (2006) S5–S9. S.B. Lovern, J.R. Strickler, R. Klaper, Behavioral and physiological changes in Daphnia magna when exposed to nanoparticle suspensions (titanium dioxide nano-C60, andC60HxC70Hx), Environ. Sci. Technol. 41 (2007) 4465–4470. Elijah J. Petersen, Jarkko Akkanen, Jussi V. K. Kukkonen and Walter J. Weber Jr. Biological Uptake and Depuration of Carbon Nanotubes by Daphnia magna. Environ. Sci. Technol., 2009, 43 (8), pp 2969–2975. Petra Jackson, Nicklas Raun Jacobsen, Anders Baun, Renie Birkedal, Dana Kühnel, Keld Alstrup Jensen, Ulla Vogel and Håkan Wallin. Bioaccumulation and ecotoxicity of carbon nanotubes. Chemistry Central Journal, 2013, 7,154. X. Tao, J.D. Fortner, B. Zhang, Y. He, Y. Chen, J.B. Hughes, Effects of aqueous stable fullerene nanocrystals (nC60) on Daphnia magna: evaluation of sub-lethal reproductive responses and accumulation, Chemosphere 77 (2009) 1482–1487. M.S. Diniz, A.P. Alves de Matos, J. Lourenço, L. Castro, I. Peres, E. Mendonça, A. Picado, Liver alterations in two freshwater fish species (Carassius auratus and Danio rerio) following exposure to different TiO2 nanoparticles concentrations, Microsc. Microanal. 19 (2013) 1131–1140.